Zainab invites you to discover the art of Henna tattoo and the magic of Body Art. We cater Henna designs for all occasions like Weddings, Family or Corporate events, Company celebration days, Birthday Parties, Bridal showers, Henna tattoo parties, College events, Baby shower parties, Fair, Fashion shows, face painting, kids parties, full and partial designs and auspicious ceremonies and festivals to make it a memorable event. 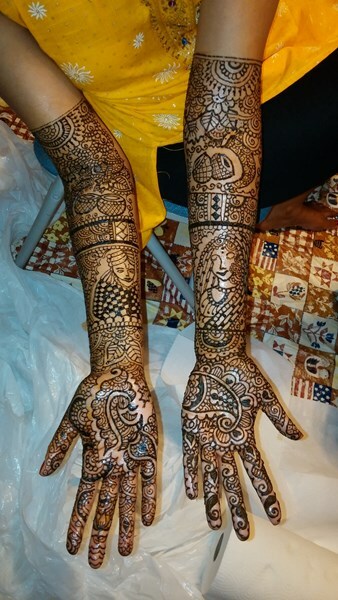 We are committed to provide you with the best Henna (Mehndi) service possible and we will do everything we can to meet your expectations. With a variety of body art services and designs to choose from, we're sure you will find something that suits you or your event. No matter what the event is, to make it an unforgettable one, contact Zainab, the leading henna artist in Greater Philadelphia with years of experience in henna! Please note Henna Services will also travel to Manchaca, Del Valle, Buda, Kyle, Cedar Creek, Dale, Manor, Mc Neil, Pflugerville, Driftwood, Lockhart, Maxwell, Round Rock, Cedar Park, Elgin, Red Rock, San Marcos, Spicewood, Leander, Bastrop, Dripping Springs, Wimberley, Martindale, Coupland, Staples, Fentress, Hutto, Mc Dade, Prairie Lea, Rosanky.